HYPER FIGHTERS. This will require triggerhappy fingers and supersonic reflexes! NINTENDO WII. NEW & SEALED CONDITION COMPLETE . Animal Crossing: Let`s Go To The City. Boxed With Wii Speak. Just Pop Each Item You Would Like In Your Basket. SUPER SMASH BROS BRAWL. for the Nintendo Wii. In good condition and complete with instructions. SNK Arcade Classics Vol.1 For The Nintendo Wii. UK sale only. Nintendo Wii Skylanders Spyros Adventure PREOWNED Boxed Game. Condition is Good. Dispatched with Royal Mail 2nd Class. The disc is in excellent condition. The manual is also included. Nintendo Wii SNK Arcade Classics Complete In Box. 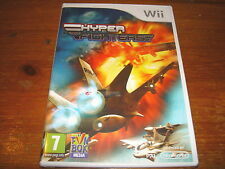 German print version, plays in English on all Pal Region Wii's. Tested on my Wii U No Issue. The item in the photo is the actual item you are interested in. Nintendo Wii Skylanders Spyros Adventure PREOWNED Boxed Game. Condition is Acceptable. Dispatched with Royal Mail 1st Class. (Cranium Kabookii (no glasses) -wii. flier miles not included). and special Kabookii Decoder Glasses. Up to four teams, with two or more players of all ages, can compete against each other. Spray paint the solar system on a wall (you actually hear the can shaking in your hand!). SpielLanguage usually English. Pattern picture! Item may differ from the photo. New product from dealer. The Konsolenkost-Team wishes you a lot of fun. NEW & BOXED. Item may differ from the photo. Language is English. Pattern picture! Item may differ from the photo. The Konsolenkost-Team wishes you a lot of fun. ENGLISH, boxed, used. Item may differ from the photo. Item number Item condition. Language is German. Pattern picture! Item may differ from the photo. The Konsolenkost-Team wishes you a lot of fun. boxed, used. Item may differ from the photo. Our service for you! Condition of Use. 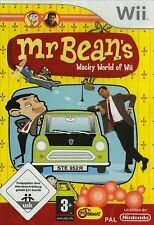 Wii - Mr. Bean's Wacky World of Wii (boxed) (used). Mr. Bean's Wacky World of Wii. Language is German. Pattern picture! Item may differ from the photo. The Konsolenkost-Team wishes you a lot of fun. 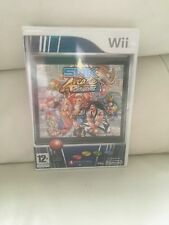 Wii - SNK Arcade Classics Vol.1 (boxed) (used). SNK Arcade Classics Vol.1. Language is German. Pattern picture! Item may differ from the photo. The Konsolenkost-Team wishes you a lot of fun. boxed, used. Mr. Bean's Wacky World of Wii. Mr. Bean experienced his previously craziest adventure - and invites you to do so. Platform: Nintendo Wii. TIM the Orginal minion Teddy - Bob's teddy bear about 30 cm cuddly soft toyEUR 11,90. Wii - Arcade Zone (boxed) (used). Arcade Zone. Language is German. Pattern picture! Item may differ from the photo. The Konsolenkost-Team wishes you a lot of fun. boxed, used. Item may differ from the photo. Wii - Namco Museum Remix (UK Version) (boxed) (used). Namco Museum Remix. Language is German. Pattern picture! Item may differ from the photo. The Konsolenkost-Team wishes you a lot of fun. UK Version, boxed, used. Tamagotchi - Party On. Nintendo 3DS. Nintendo 3DS Konsolen. Nintendo 3DS Spiele. Nintendo 64. Nintendo DS, DSi, Lite. Nintendo DS, Dsi, Lite Spiele. Nintendo DS, Dsi,Lite Konsolen. Gottlieb Pinball Classics. Wii | Indiana Jones und der Stab der K?ige | in. Nintendo Wii. Nintendo Wii U. Nintendo 3DS. Nintendo 64. Nintendo DS, DSi, Lite. Nintendo NES. Language is German. Pattern picture! Item may differ from the photo. The Konsolenkost-Team wishes you a lot of fun. boxed, used. Item may differ from the photo. Our service for you! Cancellation Right.